We currently have a working prototype where a voice assistant can be added as a friend to the Switchboard contact list.“Switchboard Assistant” answers questions about Switchboard, but we can easily incorporate other bots or build custom bots / assistants tailored to your business' needs. 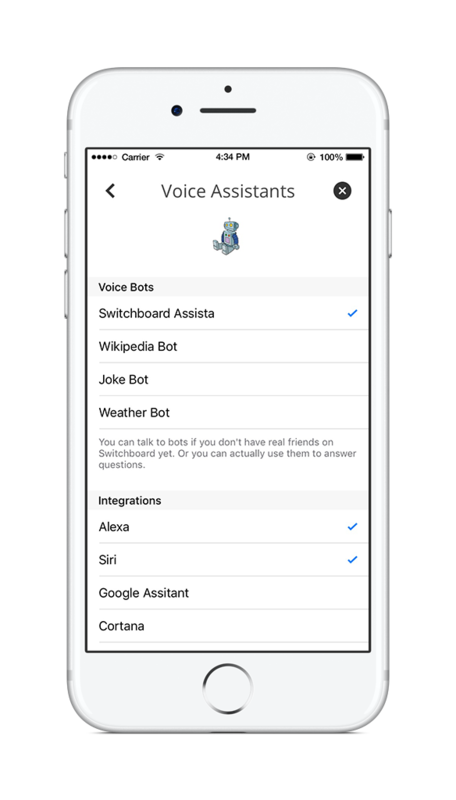 We have working prototypes with several existing assistants and can connect Switchboard (or your customized version of Switchboard) to Siri, Google Assistant, Alexa, Watson, and Hound. ‘Bots’ or 'assistants' can be added as friends in the contact list. We can also build integrations at the hardware level such that users can interact directly with Switchboard through smart speakers and other devices without having the app already running in the background.